The Canadian book publishers industry generated operating revenue of $1.6 billion in 2016, down 0.6% compared with 2014. Operating expenses decreased 1.4% to $1.5 billion, resulting in an operating profit margin of 10.2%. Salaries, wages, commissions and benefits totalled $379.7 million in 2016, down 1.9% from 2014, and accounted for the largest portion of total operating expenses (25.7%). Other large contributors to total operating expenses were cost of goods sold (20.1%) and subcontracts (15.4%). The regional distribution of operating revenue was relatively unchanged from 2014 to 2016, with companies operating in Ontario and Quebec accounting for the majority of the activity in the industry. Book publishers in Ontario ($1.1 billion) accounted for two-thirds of total operating revenue in 2016, down 0.6% from 2014. 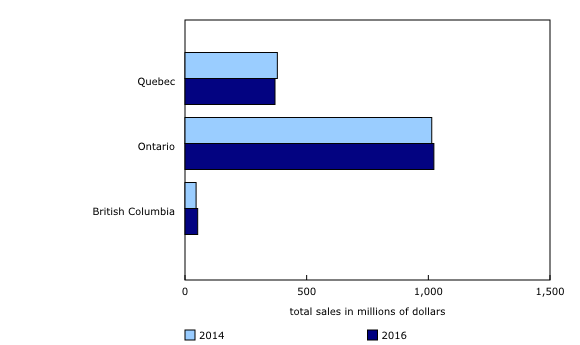 Publishers in Quebec reported $434.5 million in operating revenue, down 0.7% from 2014. Total sales amounted to $1.5 billion in 2016. Of total sales, book sales (own and exclusive agency titles) increased 0.5% from 2014 to $1.4 billion in 2016, while all other sales declined 7.9% to $108 million. Of the $1.4 billion in book sales generated in 2016, 53.8% was attributable to foreign-controlled firms, while 46.2% was generated by Canadian-controlled firms. Domestic sales accounted for 81.0% of book sales, while export sales made up the remaining 19.0%. Exports sales increased 11.8% in 2016 to $260.5 million. Domestic book sales declined 1.9% from 2014 to $1.1 billion in 2016, due to lower sales of exclusive agent titles (-6.1%). Sales of publishers' own titles partially offset this decline, increasing 0.8% from 2014. Among sales from publishers' own titles, educational titles (+4.9%) and children and juvenile books (+18.4%) posted gains during this two-year period. These gains were partially offset by lower sales of other trade titles (all formats) such as fiction and non-fiction mass market books. The largest customer category for book publishers' sales of own and exclusive agency titles in Canada was bookstores and other trade sales ($520.1 million), which includes major chain book stores and independent book stores such as university and college bookstores. This was followed by educational institutions ($188.4 million), such as primary and secondary schools, and wholesalers ($151.0 million). Sales of print titles accounted for $1.2 billion of total book sales. Sales over the Internet represented $166 million of print title sales, while sales of E-books accounted for $188 million or 13.7% of total book sales. Sales of titles by Canadian authors were $701.2 million and accounted for 51.1% of total book sales in 2016, up from 48.4% (correction) in 2014. Most sales of titles by Canadian authors were from sales of publishers' own titles ($633.1 million). English-language books accounted for 81.9% of own and exclusive agency title sales, while French-language and other languages represented the remaining 18.1%.